Designing a custom reusable wine tote for your winery may not seem like something to put at the top of your “to-do-list”, but take a look at these benefits for your winery and beyond. Do Right by the Environment – Are you still using disposable plastic bags or cardboard boxes to package wine purchases? Single-use plastic bags cause a lot of environmental harm, making them a not so eco-friendly option and while it is nice to reuse cardboard boxes, ultimately they belong in a recycling bin and it can be somewhat cumbersome to give your customers a box to carry. Boxes can be difficult to carry and are a pain for your customers to have to deal with once they get home. Plus, once they are done with the box it provides no useful marketing benefit to your winery. Do Your Customers a Favor – A reusable bag designed with the intention to carry multiple wine bottles will have the support necessary to safely carry the bottles and prevent the bottles from clanking together. A well-made bag will also have a comfortable strap that easily slides onto your customer’s shoulder can easily carry up to 6 bottles of wine with ease. 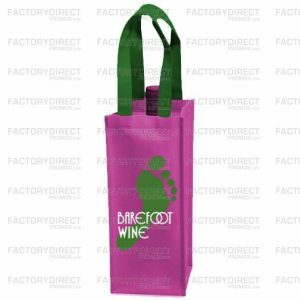 Show Your Customer’s You Value Them – Investing in custom reusable wine bags sends a message to your customers that you value their patronage. You want to make it easy and comfortable for them to do business with you, and you have their interests at heart. This is a small gesture that can lay the foundation to a solid and long-lasting relationship. Spread the Message About Your Brand and Your Product – Reusable wine totes are so great because they can be reused. Long after your customers have used your custom branded bag to carry their purchase home, they will continue to use your branded bag and that means they will put your marketing info on display when they carry your bag getting the word out about your brand. It is like creating a walking billboard for your brand at a very low cost. Create a Mood – You do your best to create an experience at your winery and tasting room. From the décor, to the music that plays, to the way your staff interacts with customers so creating a durable and customized bag is in-line with this practice. Giving your customers a well-made reusable bag to carry your products in is a nice act that lends your business a sense of refinement. Between the environmental implications, to establishing a rapport with your customers and considering the marketing returns there is a lot to be gained from creating a reusable wine tote for your winery. Do you have questions about our selection of reusable wine totes or the design process? Do you need a quote? Fill out a quote request located on each page of our site or let us know HERE and we’ll get started.